This professionally decorated luxurious 3 bedroom, 4 bath luxury residence has breathtaking ocean views from its infinity edge pool, each bedroom and the living room too, where sliding doors open fully, allowing you to enjoy an indoor/outdoor Pura Vida lifestyle surrounded by nature and tropical beauty. The spacious home comes fully furnished and turn-key with everything you need to enjoy living a carefree comfortable life in paradise. The huge chef's kitchen features granite countertops, large entertainment island, all stainless steel appliances, dishwasher, and wine cooler too. The kitchen is an open concept, flowing into the living area and dining room, all overlooking your ocean view outdoor terraces and pool. The beautiful staircase is a showpiece leading to three beautiful bedrooms with spacious custom closets and a second-floor sitting area too. The master bedroom features an en-suite beautiful bathroom with large jacuzzi jet tub. Situated on over half an acre, the home also has walking paths and fruit gardens located on a gently sloping hill behind the two-story home. And located between Esterillos Oeste and Esterillos Centro, you are just a short 20-minute drive south from popular beach town Jaco, and 30 minutes north of Quepos Perez Vela Marina and Manuel Antonio too. You also are also near to shopping, nightlife, live music, fine dining, medical clinics, and hospitals also. 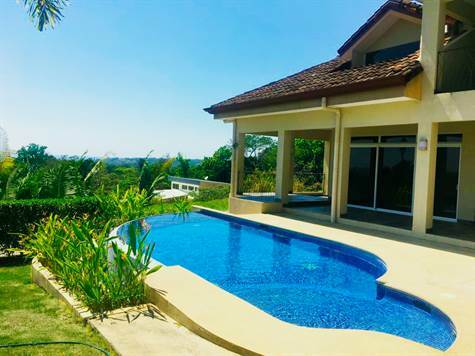 There are also dozens of restaurants from casual beach grills and pizza to Meditteranean and Caribbean Asian Fusion all within five minutes of your beautiful new Pura Vida home in paradise. The beachside gated community is just off the Coastal Highway with 24/7 security and on-site property management. The H.O.A. fees are only $125 a month and that includes guards, garbage pickup and maintenance of the communities extensive hand-laid brick paver roads and light posts throughout. The community is conveniently located just one mile from the beach where you can enjoy beachcombing, tranquil tidal pools, surfing, sports fishing, horseback riding, and ATV tours too. All sorts of adventures are just a short drive away from canopy tours, whitewater rafting, nature preserves, golfing, tennis, butterfly farms, fine dining, live music, yoga, and art walks too. This beautiful home sits on over half an acre with walking paths and fruit gardens located on a gently sloping hill behind Esterillos Oeste and Esterillos Centro, just a short 20 minute drive south from popular beach town Jaco, and 30 minutes north of Quepos and Manuel Antonio, you are near to shopping, nightlife with live music, restaurants, medical clinics, and hospitals too. There are also dozens of restaurants all within five minutes of your beautiful new Pura Vida home in paradise. This home is Conveniently located just one mile from the beach and a few miles between Jaco and Quepos/ Manuel Antonio National Park, enjoy beachcombing, surfing, sports fishing, golfing, tennis, horseback riding, ATV adventures, Canopy tours, visits to butterfly farms and nature preserves, fine dining, and great shops., not to mention one of Costa Rica's best zip lines!